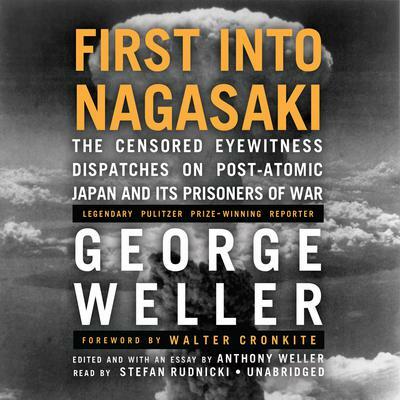 On September 6, 1945, less than a month after the atomic bomb was dropped on Nagasaki, George Weller, a Pulitzer Prize–winning reporter, became the first free Westerner to enter the devastated city. Going into hospitals and consulting doctors of the bomb’s victims, he was the first to document its unprecedented medical effects. He also became the first to enter the Allied POW camps, which rivaled Nazi camps for cruelty and bested them for death count. Among the prisoners’ untold stories was of their voyage to imprisonment in Japan on “hellships” that transported them so inhumanely that one third of them died in transit. Heavily censored by General MacArthur, most of these dispatches were never published and believed lost—until now. This historic body of work is a stirring reminder of the courage of rogue reporting that ferrets out the truth. On September 6, 1945, less than a month after the atomic bomb was dropped on Nagasaki, George Weller, a Pulitzer Prize–winning reporter, became the first free Westerner to enter the devastated city. Going into hospitals and consulting doctors of the bomb’s victims, he was the first to document its unprecedented medical effects. He also became the first to enter the Allied POW camps, which rivaled Nazi camps for cruelty and bested them for death count. Among the prisoners’ untold stories was of their voyage to imprisonment in Japan on “hellships” that transported them so inhumanely that one third of them died in transit. Heavily censored by General MacArthur, most of these dispatches were never published and believed lost—until now. This historic body of work is a stirring reminder of the courage of rogue reporting that ferrets out the truth. Stefan Rudnicki's narration brings such a powerful presence to this book. First hand accounts and eyewitness stories of the destruction of Nagasaki. A journalists fight to tell the truth that was stifled and then lost for many years. A must have in your audiobook collection!